To Warwick Estate on the R44 north of Stellenbosch towards Paarl. This time last year they had builders constructing a new tasting facility and now it is complete. From the noise, dust and bulldozers then I had expected wholesale destruction and rebuilding, but that has not happened. The old historic barrel cellar has been most sympathetically modified to include a delicatessen and much expanded tasting room displaying Warwick’s current and library wines for sale. The wooden deck I remember from my first visit in 1996 is still there, overlooking the lake and there is a new open area shaded by trees under which tables and chairs are dotted. Near the lake are shelters woven from branches in which you can picnic with foods from the delicatessen and fresh baked ciabiatta bread. A cleverly designed cardboard box contains a cold meal for two: open it to find small jars of chutney, dips, hummus, couscous, salmon smoked on the farm over wine barrels, charcouterie, cheeses and more and to finish off there’s incredible brownies and a bag of Maynards Wine Gums to take away. But what about the wines? 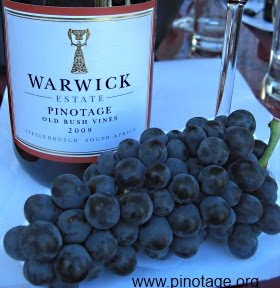 Warwick are known for their ‘Old Bush Vine’ Pinotage and the latest vintage release, 2009, is on track to be one of the best. Deep plummy yummy fruits on the front are followed by rather firm tannins on the finish. The wine spent 14 months in second and third fill 225L barriques and I think it needs a little more time in bottle for the fruit and tannins to meld. To my surprise while I was in the tasting room a party from The Circle of Wine Writers arrived for an invited tour and tasting. 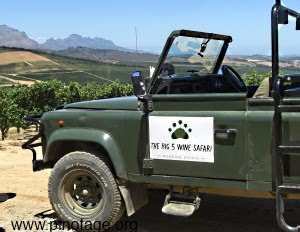 Many were friends with whom I had visited other wine regions and they insisted I join them for a tour of the vineyards in Warwick’s safari truck and Managing Director and co-owner Mike Ratcliffe kindly invited me to picnic with them afterwards. Mike's new intensely planted trellised Pinotage vineyard is now coming on stream and he remarks that the ‘Old Bush Vine’ labelling is now more of a brand name because grapes from trellised vines were also used. Production has increased to meet growing demand. Mike revealed that some Pinotage grapes had been partially dried and blended in to give added complexity and that this year he was experimenting with making an Amarone style Pinotage. But he said that he was always experimenting and admitted most didn’t work out the way he hoped. I also tasted Warwick’s ‘Three Cape Ladies’ 2007 Cape Blend. I had enjoyed this a few days previously at a braai with friends. Originally a blend of three varieties, this vintage contains a fourth — a dash of Merlot. The other three are Cabernet Sauvignon, Pinotage and Shiraz. It is a popular and classy wine, like good Bordeaux with a richness and sweetness you don’t find in claret. Mike mused if the name required him to use just three varieties or whether his mission was to make the best wine he could for that vintage and he felt that if a splash of Merlot (he thought maybe 5%) improved it, he should go ahead. 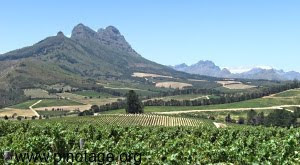 Mike said he was going to increase the percentage of Pinotage from next year now that he had more producing vines. Mike was in a philosophical mood. He posed a question about whether old vines produced better wines than young vines that started a long discussion among the wine writers. But he soon was back to business when viticulturist Ronald Spies, who’d walked us through the vineyards, arrived with bunches of Pinotage grapes. They tasted so ripe and sweet, but Mike detected unripe stalks and said he’d instruct that their imminent picking was delayed for another week. Warwick are proud that their Bordeaux blend Trilogy has just been selected by The Wine Society for aging. Several thousand cases would be held back for some years until judged nicely mature for release; this was the first South African wine to be treated this way. Cellar Door prices: Warwick ‘Old Bush Vine’ Pinotage 2009 costs 95R, Three Cape Ladies 2007 is 105R and Trilogy 2008 is 235R. Warwick Wine Family Club members get 20% discount.